If there is one drink everybody can enjoy in the hot summer days, it would be the smoothie. But believe us when we say that once you learn how great a green smoothie can be, you’ll never want to put anything else in your blender aside from veggies and fruit. The only problem with vegetable smoothies is that they don’t look like much. Why would someone want to drink a glass of something that resembles goo, right? However, before you turn your head away in disgust, check out how and why you should make a green smoothie today. Similar to a salad, a green smoothie is very refreshing, especially if the weather is hot and you’re craving for something cold and smooth. However, that’s far from being the only good thing about this godly beverage. Making a smoothie is fairly easy – just pick the things you like, throw them into the blender, and mix them until they are one healthy and tasty drink. It’s up to you to choose what you are going to put in your smoothie. If you need an energy boost, make sure to add fruits such as bananas, oranges, apples, pears, and berries. 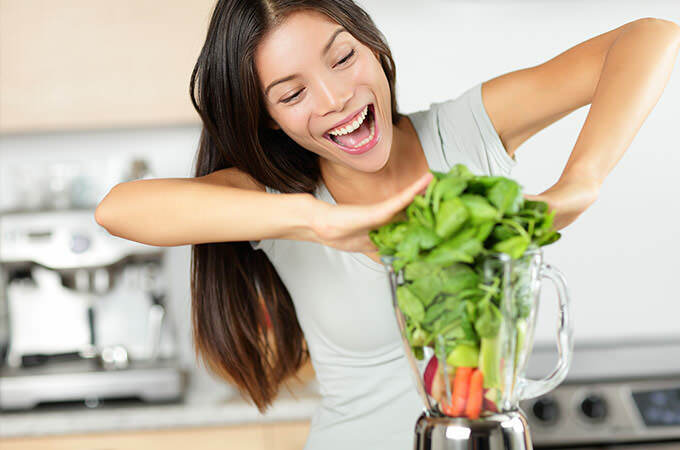 On the other hand, if your diet is lacking leafy greens, throw some spinach, kale, or collards into the blender to get some balance. Finally, you’re obliged to have at least one superfood in your smoothie. This means chia seeds, cacao, coconut oil, cinnamon, and vanilla are obligatory ingredients for any healthy green smoothie.